The Jonathan Merage Foundation committed to a $130,000 investment to the University of Colorado Boulder’s College of Engineering and Applied Science for the procurement of a tracker vehicle and a new lightning detection instrument to be integrated into a small, unmanned aircraft. This system is being designed to measure electric field changes associated with lightning strikes. Tempest UAS in flight during the VORTEX2 project. This investment is a continuation of support from the Jonathan Merage Foundation, which provided seed funding in 2010 to the college’s Research and Engineering Center for Unmanned Vehicles (RECUV) as part of the VORTEX2 project, allowing RECUV to develop a mobile ground station for unmanned aircraft systems (UAS). The VORTEX2 field campaign was the largest experiment ever deployed to study tornadoes. The new investment will include the purchase of a SUV that will enable fully-nomadic storm chasing with lightning detection capabilities from the unmanned aircraft, known as Tempest UAS. The system is laid out so that the Tempest UAS will operate on autopilot and with the flight computer to track a WiFi node on the SUV. This provides a “radio tether” to keep the aircraft in sight of an observer in the SUV. 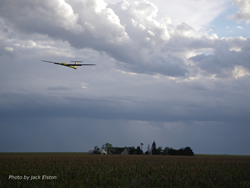 The Tempest UAS will carry a new lightning-detection instrument to measure the electric field that accompanies cloud-to-ground lightning strikes and capture a new level of data directly from the sky. The project is designed to unfold in three phases over the next year, beginning with baseline analysis and integration of the systems followed by test flights and finally, deployments on thunderstorms in spring of 2015. The Jonathan Merage Foundation, founded by passionate young philanthropist, Jonathan Merage, focuses on advancing the study of education, and activities surrounding science and severe weather. The foundation seeks to invest in innovative and pioneering approaches to further our understanding of the world around us. At the College of Engineering and Applied Science, CU-Boulder faculty have pioneered a new approach to engineering education that places the student's needs first. The college has a tradition of excellence in engineering education dating back to 1893, and continually updates and improves the programs to reflect the highest standards in teaching and learning, discovery and innovation, and community and culture.